Some discussions on Twitter recently got me thinking about Dark Elf comp. Dark Elves have become a less dominant force in the past couple of years for a number of reasons. Firstly, a lot of people who were playing them regularly have drifted to new armies - understandable given the book is coming up to 5 years old. I was shocked when five turned up for NZTC. 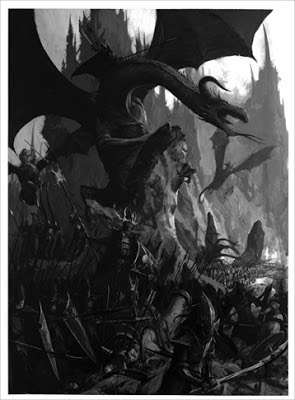 Secondly, the rules of 8th coupled with the release of new books - with increasing Monstrous Cavalry for instance - have rebalanced the meta significantly and Dark Elves seem to have suffered more than most. Thirdly, and leading on from the second point, Dark Elves have suffered from "legacy comp" related to the halycon days of 7th. The restrictions that were put in place to soften them in the last edition have never really been relaxed. Lastly, and again related to previous points, their main strike unit Black Guard has a model cap of 20 in a game where 20 T3 models can evaporate in the blink of an eye. Non warmachine shooting is limited to 90 shots per army - count the number of shots, not models. So for example Dark Elf Warriors with repeater crossbows count as 2 shots. Of those restrictions, I have previously relaxed the restriction on Hydras. In today's meta I personally don't think two Hydras is excessive - especially with cheap access to a character flaming ward and to flaming attacks. The other one I would consider relaxing is the restriction on maximum of 6 magic dice for a spell. This is very much a legacy restriction reaching back to the first days of 8th. We have now had seven 8th Ed Army Books released and I struggle to see many situations where it would be gamebreaking. Of the others, the unit limit of 450 points, a cap on shots, a race specific limit on flyers and the restriction on Crown/Pendant all have a place in restricting the more annoying (non-fun) builds. I would remove the 20 model cap on blackguard. Make it max 450 points like anything else. The hydra is still the most efficient monster in WHFB, so I think the 0-1 should stay. I think consideration should be given to a 7 dice maximum for Dark Elves. It aligns with the army design, without giving the 9+ dice Mindrazor autowin button back to the army with hatred-reroll 3+ attack models. Double Hydra wouldn't be too bad for my Dwarves with our flaming artillery, but might be a concern for many other armies. Jossy has a point about the 20 model limit on Black Guard. I'm not sure about 450 point cap though, given that they are 13 points for WS5 Stubborn, ItP, reroll S4 attacks (at 2pm). Banner of Hag Graef for ASF or Banner of Murder at 25pts for Armour Piercing make them very tasty still. Maybe a 400 point maximum? I agree on both changes. At the very least try it and see what happens, cause its clear Dark Elves aren't exactly destroying the world right now. When Warriors can take two Hellcannons, plus other Flying Gribblies, I see no reason why Dark Elves can't have 2 Hydras. See don't like the idea of changing model cap on Black Guard. That seems like fiddling for the sake of it (and introducing another rule change). Why is two Hydras "broken" or gamechanging? Why is no dice limit "broken' or "game changing"? Keen to know why people want those restraints. As James says nowhere in the word are Dark Elves dominating be it light or heavy comp....or even silly Oz subjective. I like the idea of heavily armoured cavalry and large monsters like Kadaii, HPA, Hydra etc having to be scared of infantry. Remember rolling shitloads of dice means likely Loss of Control which means chance of warp, losing the spell etc. Not suggesting the 12 PD gap goes just a loosening of this imposed DE restriction. What do DE players think? Thing is though, in 7th the 20 model cap for black guard was warranted. The Black Guard where almost unbeatable with the ASF and whatnot. These days, with step up, T3 infantry (stubborn or not) get cut down just like the rest. All new books have no restriction on unit size. Black Guard are just dark elve White Lions/Phoenix Guard. Nobody has issue with these guys being used (in fact a lot of comp allows High Elves to take 550 point units). My issue with the Hydra is not the rules/model, but the points. Its too cheap. As far as the dice limit goes, allowing anyone in 8th to throw 12 dice to get that one spell through is unbalanced. We already have enough people moaning about no.6 spells and powering up. On the other hand +1 dice bonus still gives dark elves an advantage, but not one that is considerably better than most. It dosn't modify the averages of rolling double six that much. I would suggest you try all your amendments, and see what happens, you may find that there are less high level players that feel like putting down their new toys to find out, rather than drying their DE tears and dusting off their Hydras. Ah yes, legacy comp, I've felt it's cruel caress. I will let you know how double hydras go at NATCON. Happy with DE's being allowed to use more than 6 dice, but needs a limit, I'd be happy with 7 or 8. Warriors with repeater crossbows count as 2 shots. This should be 1 rule for all, don't get x points for most armys, but y for others. Don't believe allowing Black Guard to above 20 models is a good idea. 2 Hydra's are not that scary really, under costed yes, but again a cannon ball away from death at all times. Remove, you want a flying a circus be my guest. Pete I took Darkies to NZTC cause Reid had them painted and they were a change - not because we belived they rule. The shooting and points caps aren't race specific, can't see any reason why you'd make exceptions for Dark Elves. Like Mike I'd happily drop the more than 90 shots sure its not a great game but its also not going to win large numbers of games. The 3 fly should either be race specific or dropped; sure some lists can't do it but why penalise dark elves. Hydra's are great for their points; but they're still easy points in todays meta; not bothered either way on this one. 20 models is a size cap from their book right? For that reason alone, I'd say leave it. Or start down the sad road of considering changing the number limits on other books, like those OP wood elves. But of the specific ones, pendant/crown is the only really important one to keep.